Leather needle buckle makes an adjustment for your wrist more flexible. 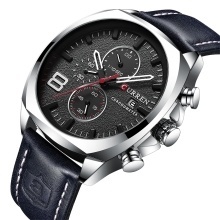 Chronograph watch, 1/10 seconds dial, seconds dial and minute dial. the new creative timekeeping features, keep perfect time accuracy.